We offer Suzuki instruction in violin, viola, cello and piano, for students age 2.9 and up. We have several registered Suzuki teachers, offering Suzuki violin/viola instruction up to Book 8, Suzuki piano instruction up to book 4, and Suzuki cello instruction up to book 2. 1) Starting with our "Intro to Violin with Suzuki Method" 8-week group class for age 3-5 or 5-7. This is a general introduction to violin based on Suzuki philosophy and methodology (see below), with three to five parent-child pairs per group. 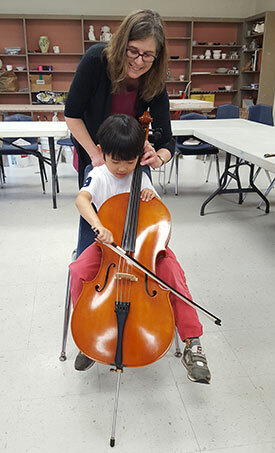 New groups begin several times a year, and families may choose to take either one or two 8-week sessions, before transitioning to their choice of the standard Suzuki program or traditional private lessons. Intro to Violin Level 1: $220 for 8 classes, including instrument rental, book and CD. Intro to Violin Level 2: $245 for 8 weeks, including instrument rental. 2) Starting immediately in the standard Suzuki program of weekly Suzuki private lessons, plus optional (but strongly recommended) Suzuki supplemental group class. Private lessons: 20 mins (age 2.9 - 4) - $30.50 30 mins - $45 (Longer lessons for older/more advanced students: see here.) Day and time by arrangement. Supplemental group class for private lesson students (violin/viola/cello): 14 themed group sessions per semester, plus group class concert, informal outreach concert, and parent event. Students of non-WSM teachers may join our group classes with written permission from their teacher. Just as parents are naturally involved in their children’s acquisition of language, with the Suzuki method parents are involved in the musical learning of their child. They attend lessons with the child and serve as “home teachers” during the week. Sometimes the parent learns to play before the child, so that s/he understands better what the child is learning to do. But no prior musical experience is required of the parent - the teacher will help both parent and child. Parents work with the teacher to create an enjoyable learning environment. The early years are the time of explosive development in mental processes and muscle coordination. Listening to music may begin at birth; formal training may begin at age three or four, but it is never too late to begin. Children learn words by hearing them spoken hundreds of times by others. In the same way, listening to music every day is key, especially listening to pieces in the Suzuki repertoire so that the child absorbs them before ever playing them – just as s/he does with nursery rhymes or advertising jingles! Repetition is a key factor in learning of any kind, including learning an instrument. Children do not learn new words or pieces of music and then discard them. Instead, they add them to their vocabulary or repertoire, gradually using them in new and more sophisticated ways. The Suzuki method is developmentally targeted to young children. Children build strong foundational skills through creative and playful activities alternating between exercises, movement, and song (video here and here). Teacher, child and parent work together - no prior experience is needed, as parents learn right along with their child in class and partner with them at home. As the children grow they build on this foundation, transitioning gradually and naturally to increasing mastery and independence in their learning. What is the difference between Suzuki lessons and traditional private lessons? At Wayland School of Music we do not believe that one approach is “better” than the other. Above all, the most important factor in your child’s learning is an expert, experienced and enthusiastic teacher who really knows how to connect with children and is a good personal “fit” for your child. Generally start at age 5 or up. Can start as young as 3 or 4. Music reading is usually taught from the beginning stages. Music is initially learned by ear through repeated listening to recordings; music reading is not added until the child is fluent in the language of music (just as with oral language acquisition), and has developed basic technical proficiency. Parents may attend lessons (and are often encouraged to do so) but are not required to attend. Parents are an integral part of the teacher/child/parent “Suzuki triangle”, learn along with their child, and partner with the child at home (no previous experience is required, however!). Parents may help their children practice (and are often encouraged to do so) but are not required to. Parents are their child's practice partner at home throughout the early years of lessons. Lessons are always individual, and the opportunity to play with other children depends on teacher and music school. In the early stages lessons are either individual or in small groups of two or three, with each child receiving individual attention while others observe; a group class is also an integral part of the curriculum. Teachers choose their own curriculum and materials based on personal preference and approach, which may vary widely. Training and experience may also vary (and should always be thoroughly investigated). Teachers follow a standardized curriculum with standardized materials; they have undergone intensive training specific to the Suzuki method, and are registered as having completed that training. NB Be wary of those who claim to be "Suzuki based" unless they also show proof of Suzuki training: merely "using the books" does not make someone a Suzuki teacher. "In case there was any question about whether my son liked his lesson today, he has been "practicing" all night (rest position, playing position, slow song, fast song, take a bow). After a while I realized it was pretty quiet, and I found him asleep on our living room floor!"